Monument to Zumbi, by Lázaro Souza Duarte. Salvador, Bahia, Brazil. Photograph by Ana Lucia Araujo, 2009. Slavery has become a popular topic in newspaper articles, television documentaries, motion pictures, discussion forums, and academic conferences over the past decade. In the Americas, and even in Europe and Africa, slavery and especially the Atlantic slave trade have taken central stage in the public arena. Considering that slavery was legally abolished in the western hemisphere more than a century ago, how and why has the slave past of western societies become so central in present-day public debates? How have these debates and the initiatives memorialising slavery in the public space contributed to healing the wounds of the past? Only with the end of the Second World War and the exposure of the horrors of the Holocaust did the wounds of the slave past started to become visible and receive official attention. Already by those times, discussions of slavery did not always refer to the past, but rather to the on-going conditions of exclusion faced by black populations in societies involved in the Atlantic slave trade. The collapse of colonial rule in Africa and the rise of the US civil rights movement further contributed to the fight against racism and racial inequalities led by the populations of African descent. This new context helped black activists and organisations demand that national governments officially recognise the contribution of populations of African descent to the wealth of societies that benefited from slavery and the slave trade. These demands can also been seen as a response to globalisation that emphasises cultural and human diversity as well as specific identities. As part of this process, slavery, the slave trade, and other crimes against humanity received greater attention. Gradually, the slave past resurfaced in the public space and started to occupy an important place in the discourse of political actors. The commemoration activities of 150th anniversary of the arrival of Columbus in the Americas in 1992 helped launch The Slave Route Project by UNESCO. During this time period, leaders like Pope John Paul II and US President Bill Clinton publicly expressed their sorrow for slavery and the Atlantic slave trade. The twenty-first century witnessed an increasing interest in slavery and the Atlantic slave trade, especially with the bicentennial of the abolition of the British slave trade in (2007). Gradually, social actors in Africa and the Americas formulated demands of reparations for slavery in the form of financial compensation. Other historical actors, such as politicians and activists, frequently expressed the need to acknowledge slavery as a crime against humanity through public commemoration, museums, monuments, and festivals. Many individuals and groups in the United States and Brazil (the two largest former slave societies in the Americas) as well as in other societies of the Americas, started to embrace a common identity as descendants of slaves. Recovering a common past associated with slavery, black social actors started demanding symbolic and material reparations. In Brazil for example, the remnant quilombo communities engaged in the fight for the definitive ownership of their lands. These demands were aimed at redressing social, economic, and racial exclusion. At the same time, in both countries most descendants of slave owners and slave merchants still occupy profitable social, economic, and political positions, which they would not risk by recalling past wrongs of their ancestors. The recent case of the actor Ben Affleck is a good example of the unwanted consequences of exposing ancestors’ involvement in the slave trade and slavery. After accepting participating in the PBS television show Finding your Roots and discovering that one of his ancestors was a slave owner, the Hollywood actor requested that the producers remove this unpleasant piece of information from his genealogy. Nevertheless, other descendants of slave merchants took a different approach when addressing the past of their ancestors. In the documentary film Traces of the Trade, several descendants of the Rhode Island slave merchant Tom De Wolf accepted the challenge of exposing the connections of their family’s wealth and its slave trading activities. In the United States, the early publication of slave narratives and novels about slavery kept the memory of slavery alive in the public sphere, despite the lack of official recognition. The television series Roots, based on the novel by Alex Haley, brought slavery into the light and became very popular around the world. However, the public recognition of this past has only rarely been expressed by the creation of permanent institutions, monuments, memorials, and other landmarks commemorating slavery. The election of Barack Obama as the President of the United States changed the game, and since his accession to office the US slave past has gained greater visibility in the public sphere. In several public speeches during his first presidential campaign, Obama evoked slavery and the slave ancestry of his wife Michelle Obama. As the first black US president, Obama’s election transcended the national boundaries, giving hope to the peoples of African descent worldwide. Though there has been reluctance to highlight the US slave past in the public space, the commemoration of leaders of the civil rights movement has been positively received. In 2011, a memorial paying homage to Martin Luther King Jr. was unveiled in Washington DC, while around the same time the construction of the National Museum of African American History began on the National Mall. These events mark a waypoint in the long process to gradually recognise the importance of black history in the US national narrative. Although not exclusively dedicated to slavery, the new institution, scheduled to open in 2016, will highlight the history of the Atlantic slave trade and slavery, not only in the United States but also in other countries of the Americas. Despite some achievements, acknowledging the crucial role of slavery to the construction of the nation remains a major challenge in Brazil as well as in the United States. Brazil imported more than five million enslaved Africans during the period of the Atlantic slave trade, more than ten times the number of enslaved Africans brought by force to the United States. African cultural heritage has always been visible in Brazil, but rarely associated with the country’s slave past. At the same time, social indicators show that the Afro-Brazilian population remains socially and economically excluded. As in the United States, racism is still a central issue in Brazil. Black activism gradually resurfaced in Brazil’s public space with the conclusion of the Cold War and the end of the military dictatorship in 1985. Afro-Brazilians started demanding affirmative action and calling for official recognition of the role played by black women and men in the construction of the nation. 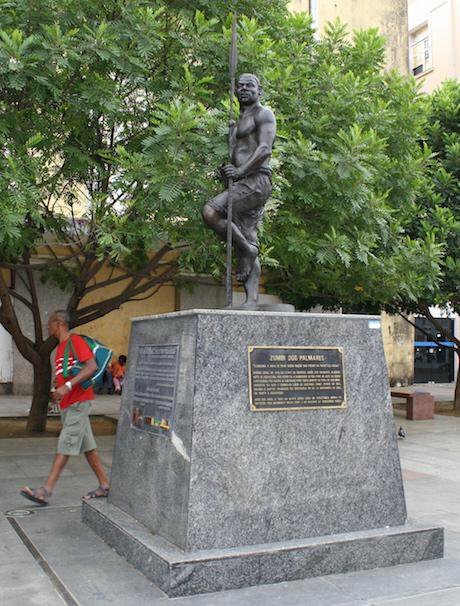 It was only as this movement gained steam that the first public monuments honouring Zumbi (the leader of Palmares Quilombo, the country’s largest and longest-lasting runaway slave community) were unveiled in various Brazilian cities. But are monuments a form of redress? Today, more than ever, slavery is becoming visible in the public space of countries like the United States and Brazil. But does the unveiling of monuments and memorials help these countries come to terms with this painful past that remains so present today? My research suggests however that at least in Brazil most slavery-related initiatives do not successfully present the complex and multidimensional history of slavery and the Atlantic slave trade. In the United States and Brazil, the development and success of projects of public monuments, memorials, and museum exhibitions focusing on slavery depend on the ability and the political weight of the various groups involved in these ventures. Constructive outcomes also depend on the speed with which official recognition of the slave past and the contribution of enslaved Africans and their descendants to these former slave societies are incorporated into the national narratives of the two countries. Memorialisation is not a linear process. The creation of public markers to commemorate slavery is a form of symbolical reparation for past wrongs. But once one group succeeds in making its own perspective on the slave trade and slavery visible, the views of other groups are almost always excluded. This dynamic, which is very particular to the work of public memory, probably hinders the development of possible initiatives that could better address and contribute to healing the wounds of this traumatic past. In societies marked by deep racial and social inequalities like Brazil and the United States, these initiatives can help redress past wrongs only if they are accompanied by concrete political and economic measures to fight persistent racism and social exclusion.